This article is about Earth's sky. For other skies, see extraterrestrial skies. For other uses, see Sky (disambiguation). In the field of astronomy, the sky is also called the celestial sphere. This is viewed from Earth's surface as an abstract dome on which the Sun, stars, planets, and Moon appear to be traveling. The celestial sphere is conventionally divided into designated areas called constellations. Usually, the term sky is used informally as the point of view from the Earth's surface; however, the meaning and usage can vary. 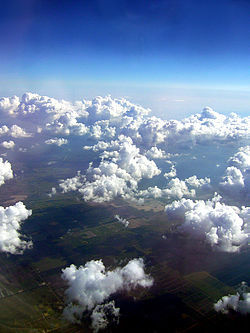 In some cases, such as in discussing the weather, the sky refers to only the lower, more dense portions of the atmosphere. During daylight, the sky appears to be blue because air scatters more blue sunlight than red. At night, the sky appears to be a mostly dark surface or region spangled with stars. During the day, the Sun can be seen in the sky unless obscured by clouds. In the night sky (and to some extent during the day) the Moon, planets and stars are visible in the sky. Some of the natural phenomena seen in the sky are clouds, rainbows, and aurorae. Lightning and precipitation can also be seen in the sky during storms. Birds, insects, aircraft, and kites are often considered to fly in the sky. Due to human activities, smog during the day and light pollution during the night are often seen above large cities. A greater proportion of blue light scattered by the atmosphere relative to red light. Civil, nautical, and astronomical twilight. Dusk is the end of evening twilight. Dawn is the beginning of morning twilight. Except for light that comes directly from the sun, most of the light in the day sky is caused by scattering, which is dominated by a small-particle limit called Rayleigh Scattering. The scattering due to molecule sized particles (as in air) is greater in the forward and backward directions than it is in the lateral direction. [clarification needed] Scattering is significant for light at all visible wavelengths but is stronger at the shorter (bluer) end of the visible spectrum, meaning that the scattered light is bluer than its source, the sun. The remaining sunlight,[clarification needed] having lost some of its short wavelength components, appears slightly less blue. The sky can turn a multitude of colors such as red, orange, purple and yellow (especially near sunset or sunrise) when the light must pass through a much longer path (or optical depth) through the atmosphere. Scattering effects also partially polarize light from the sky and are most pronounced at an angle 90° from the sun. Scattered light from the horizon travels through as much as 38 times the atmosphere as does light from the zenith, causing a blue gradient: vivid at the zenith, and pale near the horizon. Because red light also scatters if there is enough air between the source and the observer causing parts of the sky to change color during a sunset. As the amount of atmosphere nears infinity, the scattered light appears whiter and whiter. The sun is not the only object that may appear less blue in the atmosphere. Far away clouds or snowy mountaintops may appear yellowish. The effect is not very obvious on clear days but is very pronounced when clouds cover the line of sight, reducing the blue hue from scattered sunlight. At higher altitudes, the sky tends toward darker colors since scattering is reduced due to lower air density; an extreme example is the moon, where there is no atmosphere and no scattering, making the sky on the moon black even when the sun is visible. Sky luminance distribution models have been recommended by the International Commission on Illumination (CIE) for the design of daylighting schemes. Recent developments relate to “all sky models” for modelling sky luminance under weather conditions ranging from clear to overcast. The Earth's shadow is the shadow that the Earth casts on its atmosphere. This atmospheric phenomenon is sometimes seen twice a day, around the times of sunset and sunrise. When the weather conditions and the observer's viewing point permit a clear sight of the horizon, the shadow can be seen as a dark blue or greyish-blue band. Assuming the sky is clear, the Earth's shadow is visible in the half of the sky opposite to the sunset or sunrise, and is seen as a dark blue band right above the horizon. A related phenomenon is the "Belt of Venus" or "anti-twilight arch", a pink band that is visible above the dark blue band of the Earth's shadow in the same part of the sky. There is no clear dividing line between the Earth's shadow and the Belt of Venus: one colored band shades into the other in the sky. Twilight is divided into three segments according to how far the sun is below the horizon, measured in segments of 6°. After sunset the civil twilight sets in; it ends when the sun drops more than 6° below the horizon. This is followed by the nautical twilight, when the sun is 6° and 12° below the horizon (heights of between −6° and −12°), after which comes the astronomical twilight, defined as the period from −12° to −18°. When the sun drops more than 18° below the horizon, the sky generally attains its minimum brightness. Several sources can be identified as the source of the intrinsic brightness of the sky, namely airglow, indirect scattering of sunlight, scattering of starlight, and artificial light pollution. The term night sky refers to the sky as seen at night. The term is usually associated with skygazing and astronomy, with reference to views of celestial bodies such as stars, the Moon, and planets that become visible on a clear night after the Sun has set. Natural light sources in a night sky include moonlight, starlight, and airglow, depending on location and timing. The fact that the sky is not completely dark at night can be easily observed. Were the sky (in the absence of moon and city lights) absolutely dark, one would not be able to see the silhouette of an object against the sky. The night sky and studies of it have a historical place in both ancient and modern cultures. In the past, for instance, farmers have used the state of the night sky as a calendar to determine when to plant crops. The ancient belief in astrology is generally based on the belief that relationships between heavenly bodies influence or convey information about events on Earth. The scientific study of the night sky and bodies observed within it, meanwhile, takes place in the science of astronomy. Within visible-light astronomy, the visibility of celestial objects in the night sky is affected by light pollution. The presence of the Moon in the night sky has historically hindered astronomical observation by increasing the amount of ambient lighting. With the advent of artificial light sources, however, light pollution has been a growing problem for viewing the night sky. Special filters and modifications to light fixtures can help to alleviate this problem, but for the best views, both professional and amateur optical astronomers seek viewing sites located far from major urban areas. Along with pressure tendency, the condition of the sky is one of the more important parameters used to forecast weather in mountainous areas. Thickening of cloud cover or the invasion of a higher cloud deck is indicative of rain in the near future. At night, high thin cirrostratus clouds can lead to halos around the moon, which indicate the approach of a warm front and its associated rain. Morning fog portends fair conditions and can be associated with a marine layer, an indication of a stable atmosphere. Rainy conditions are preceded by wind or clouds which prevent fog formation. The approach of a line of thunderstorms could indicate the approach of a cold front. Cloud-free skies are indicative of fair weather for the near future. The use of sky cover in weather prediction has led to various weather lore over the centuries. Within 36 hours of the passage of a tropical cyclone's center, the pressure begins to fall and a veil of white cirrus clouds approaches from the cyclone's direction. Within 24 hours of the closest approach to the center, low clouds begin to move in, also known as the bar of a tropical cyclone, as the barometric pressure begins to fall more rapidly and the winds begin to increase. Within 18 hours of the center's approach, squally weather is common, with sudden increases in wind accompanied by rain showers or thunderstorms. Within six hours of the center's arrival, rain becomes continuous. Within an hour of the center, the rain becomes very heavy and the highest winds within the tropical cyclone are experienced. When the center arrives with a strong tropical cyclone, weather conditions improve and the sun becomes visible as the eye moves overhead. Once the system departs, winds reverse and, along with the rain, suddenly increase. One day after the center's passage, the low overcast is replaced with a higher overcast, and the rain becomes intermittent. By 36 hours after the center's passage, the high overcast breaks and the pressure begins to level off. Flight is the process by which an object moves through or beyond the sky (as in the case of spaceflight), whether by generating aerodynamic lift, propulsive thrust, aerostatically using buoyancy, or by ballistic movement, without any direct mechanical support from the ground. The engineering aspects of flight are studied in aerospace engineering which is subdivided into aeronautics, which is the study of vehicles that travel through the air, and astronautics, the study of vehicles that travel through space, and in ballistics, the study of the flight of projectiles. While human beings have been capable of flight via hot air balloons since 1783, other species have used flight for significantly longer. Animals, such as birds, bats, and insects are capable of flight. Spores and seeds from plants use flight, via use of the wind, as a method of propagating their species. Many mythologies have deities especially associated with the sky. In Egyptian religion, the sky was deified as the goddess Nut and as the god Horus. Dyeus is reconstructed as the god of the sky, or the sky personified, in Proto-Indo-European religion, whence Zeus, the god of the sky and thunder in Greek mythology and the Roman god of sky and thunder Jupiter. In Australian Aboriginal mythology, Altjira (or Arrernte) is the main sky god and also the creator god. In Iroquois mythology, Atahensic was a sky goddess who fell down to the ground during the creation of the Earth. Many cultures have drawn constellations between stars in the sky, using them in association with legends and mythology about their deities. ^ John Tyndall (December 1868). "On the Blue Colour of the Sky, the Polarization of Skylight, and on the Polarization of Light by Cloudy Matter Generally" (PDF). Proceedings of the Royal Society. 17: 223–233. doi:10.1098/rspl.1868.0033. JSTOR 112380. ^ Lord Rayleigh (June 1871). "On the scattering of light by small particles". Philosophical Magazine. 41, 275: 447–451. ^ J.G. Watson (June 2002). "Visibility: Science and Regulation". J. Air & Waste Manage. Assoc. 52 (6): 628–713. doi:10.1080/10473289.2002.10470813. Retrieved 19 April 2007. ^ a b Gibbs, Philip (May 1997). "Why is the sky Blue?". Usenet Physics FAQ. Retrieved 11 December 2012. ^ Yu Timofeev & A. V. Vasilʹev (1 May 2008). Theoretical Fundamentals of Atmospheric Optics. Cambridge International Science Publishing. p. 174. ISBN 978-1-904602-25-5. ^ Craig F. Bohren & Eugene Edmund Clothiaux (2006). Fundamentals of atmospheric radiation: an introduction with 400 problems. Fundamentals of Atmospheric Radiation: An Introduction with 400 Problems by Craig F. Bohren and Eugene Clothiaux. Wiley. Wiley-VCH. p. 427. Bibcode:2006fari.book.....B. ISBN 978-3-527-40503-9. ^ "Bluer on top". USA Today. 11 April 2001. Retrieved 3 June 2015. ^ a b David K. Lynch; William Charles Livingston (2001). Color and light in nature. Cambridge University Press. p. 31. ISBN 978-0-521-77504-5. ^ Darula, S., Kittler, R. (2002). "General Sky Standard Defining Luminance Distributions" (PDF). Proc. Conf. eSim 2002, 11–13 September 2002, Montreal. Retrieved 26 August 2013. ^ Young, A. (2006). "Green flashes at a glance". San Diego State University page. Retrieved 5 March 2009. ^ Nave, C.R. "Red Sunset, Green Flash". Georgia State University. HyperPhysics. Retrieved 11 August 2010. ^ O'Connell, D.J.K. (1958). "The green flash and other low sun phenomena". Castel Gandolfo: Vatican Observatory, Ricerche Astronomiche. 4: 7. Bibcode:1958RA......4.....O. ^ Les Cowley (2 August 2009). "Earth's shadow". Les Cowley. Retrieved 15 February 2012. ^ David K. Lynch; William Charles Livingston (July 2001). Color and light in nature (2nd ed.). Cambridge University Press. pp. 38, 39. ISBN 978-0-521-77504-5. ^ Dr. Irv Bromberg (4 April 2011). "The Duration of Twilight". University of Toronto. Retrieved 15 February 2012. ^ Dennis Eskow (March 1983). "Make Your Own Weather Forecasts". Popular Mechanics. 159 (3): 148. ^ Mark Moore (25 March 2009). Field Forecasting – A Short Summary. Retrieved on 15 February 2012. ^ Jerry Wilson (2012). Skywatch: Signs of the Weather. Archived 7 April 2004 at the Wayback Machine Retrieved on 25 May 2008. ^ Central Pacific Hurricane Center (23 July 2006). Tropical Cyclone Observations. National Oceanic and Atmospheric Administration. Retrieved on 5 May 2008. ^ "U.S. Centennial of Flight Commisstion: Early Balloon Flight in Europe". Archived from the original on 2 June 2008. Retrieved 4 June 2008. ^ J. Gurevitch; S. M. Scheiner & G. A. Fox (2006). Plant Ecology (2nd ed.). Sinauer Associates, Inc., Massachusetts. Wikimedia Commons has media related to Sky.